A Gift of Love for You! It's not often that I create Valentine's art, and many hours went into designing this illustrated Hearty Hat that I made for just 6 one of a kind folk art characters. The thought of retiring this hat design, shortly after all of that work seems rather silly. And so, we want to SHARE it with you! A printable PDF file has been created for you to download! Simply print it on card stock or whatever paper you desire, follow the Tips on that page and be imaginative. 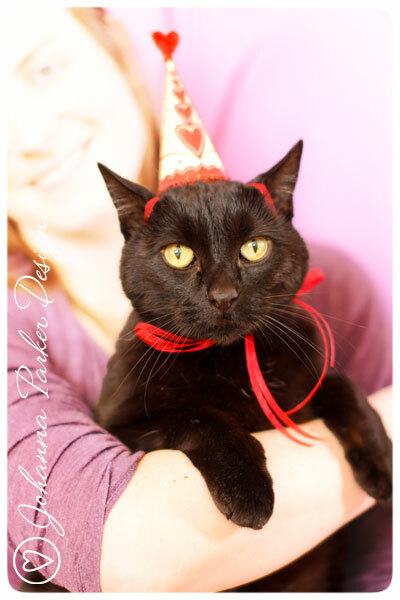 As many of you know, Jack, our black cat, often models my handmade hats. Keep an eye out for his Valentine photo shoot, here on the 14th! 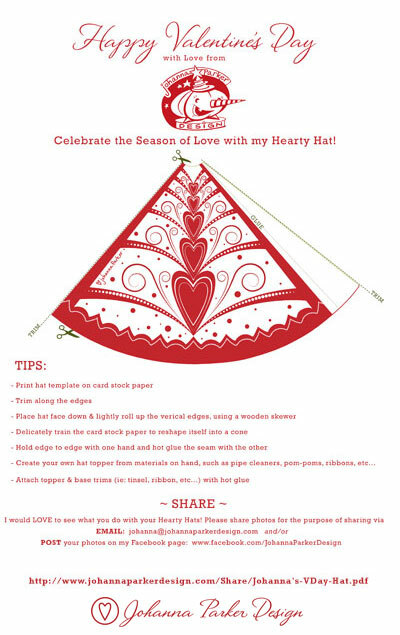 We invite you to get crafty.... We would LOVE to see your "Hearty Hat" creations and the ways you choose to decorate with them. Please EMAIL your finished project photos or post them directly on the Johanna Parker Design FACEBOOK page so that we can share them and spread the love. Have FUN and Enjoy!